The Abia State Governor, Dr. Okezie Ikpeazu, has been cleared by the Peoples Democratic Party Governorship Screening Committee to participate in the primary election ahead of the 2019 governorship election. Ikpeazu appeared before the screening committee at the South East Zonal Headquarters of the party in Enugu State. 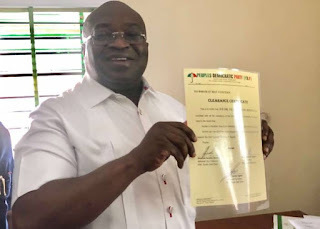 He received commendation as a worthy ambassador whose sterling performance has drawn thousands of defectors from the opposition part back to the PDP in Abia State. He was thereafter issued with the clearance certificate. The Committee Chairman, Chief Hanny Woko, said: “You’ve done very well, Your Excellency. “You are truly a worthy ambassador of our great party, the PDP. “Take a bow and go and win for us again in Abia State. On his part, the South East Zonal Chairman of the party, Chief Augustin Umahi, commended the Governor for his style of leadership and giant developmental strides, which he said contributed in making the party attractive and more popular in the zone. Umahi said: “Your Excellency, PDP has become more popular and attractive in the South East because of the good which you and your brother governors in the zone are doing. “From Abia to Ebonyi and here in Enugu, you people have made the party stronger with you good works. Speaking after his screening and clearance, Ikpeazu said: “We thank our party for giving us the opportunity to serve our people in our various states. “Our modest achievements in our states have been noticed and documented by our party and our people. “That is why I am standing here as the only aspirant for the office of governor on the platform of the our party in Abia State. “I’m very sure that my brothers in Ebonyi and Enugu States are also standing unopposed. “We thank our people and our party for believing in us. “We see this as a challenge to do more. “We will not take the trust and mandate of our people and party for granted.